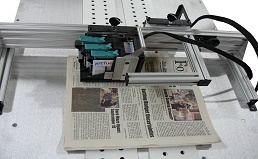 AccuFast CKx Imaging Kit - Take mailing to another level. When you need the ultimate in flexibility in your mailroom equipment, you need the AccuFast CKx Imaging Kit. This high end address printer will print anything during nearly any stage of your mail production – it’s the workhorse you can’t afford to do a big mailing without. 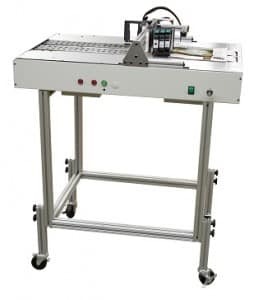 The AccuFast CKx Imaging Kit easily attaches to a variety of mailing bases and conveying systems, giving you the ultimate in control. 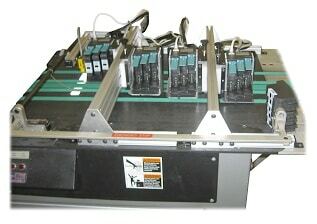 Choose up to four imagers per kit, for a total of eight inches of print range. You can also specify the print direction, print coverage, material thickness and support bar width when you order your customized kit. Imagine spraying your bar codes or addresses straight on your materials, saving time, money and labels during a mail campaign. The included Jet.Engine Imaging Software gives you even more ways to personalize your mailers, granting your AccuFast CKx Imaging Kit the ability to print static logos or graphics as well as dynamic addresses and other data that standard address printers can’t even begin to process. Standard clearance over bed: 1/2 inch, adjustable to any height. Supports up to 24 inches of bed space. Print in 150, 200, 300 or 600 dots per inch resolution. Requires 110 or 230 volt power source.